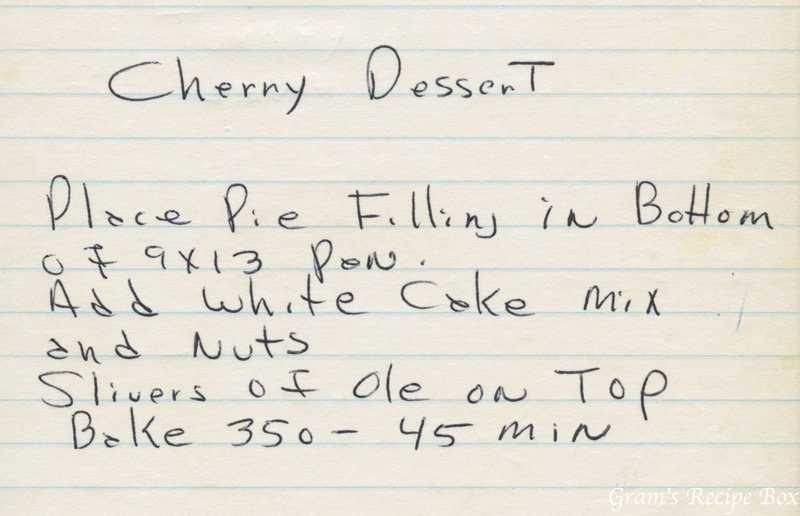 Here’s another take on cherry dessert that is clearly lacking detail! My notes below, again. Place pie filling in bottom of 9×13 pan. Pour the can of cherry pie filling into a 9×13 pan. Sprinkle the cake mix and nuts on top of that. Top with slivers of margarine or butter. I’m just curious about all the cherry pie filling desserts–why did people think dumping a can of this stuff and subsequently baking it made a dessert??? There are so many of these recipes! Guess I’m just not much of a fan of cherry pie filling. It would never occur to me to use it as the main portion of a dessert. Then again, I’ve never made a dump cake so maybe I just have a problem with dumping. I seem to recall that for a while in the 80s cherry everything was popular. I don’t know if there was a push by the Comstock marketers or what lol. I prefer to make cherry pie with fresh cherries myself. This is probably not a recipe I would make myself.